Kalandra Jane - Millinery and Musings! 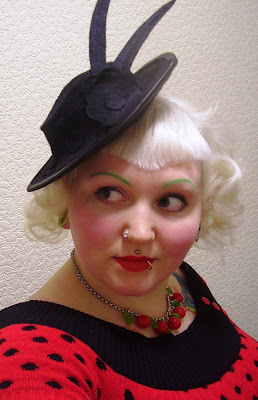 : New 1940s Hats, and other lovely things! 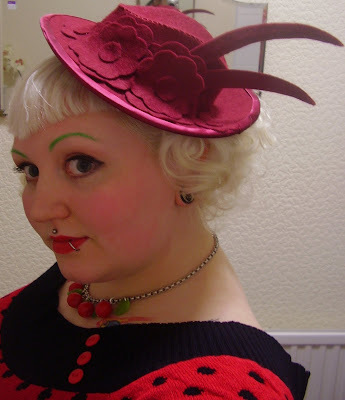 New 1940s Hats, and other lovely things! Here is a sneaky peek at my new hat design - I have tried to go for a more 1940s inspired look, and I am quite happy with it. I'm considering making the brim a little narrower, what do you think? I also wanted to have the height and sculptural look that feathers give, but also wanted to keep it vegan and monochrome. Hence, wired felt plumes! I am just doing black or burgundy as standard, but can of course do any colour as a special order. These will be available in my eBay shop very soon, or contact me directly! I also have two (possibly three) wonderful professional photoshoots lined up with some very talented photographers and pinup models, which will feature these hats along with some of my other designs, which I will of course post here! Also featuring my lovely new jumper, which is a short sleeved off-the-shoulder 'Scarlett Fever' top by Miss Fortune Clothing. It is currently sold out on their website, mine was purchased from my lovely friend Kathy at Rockers on Oldham Street, Manchester. Her shop is full of desirable things; clothing for guys and girls, hot rod and tiki paraphernaila, jewellery, music, and of course hats by Kalandra Jane! Go and have a browse. My necklace is also from there, made by Classic Hardware and was a Christmas gift from Aerospace Boyfriend. I love it so much, I've barely taken it off since Christmas day. I also received some pictures from the girls at Hocus Pocus Theatre featuring my Sailor and Nautical Stripe hats! The corsets were made by the amazing Kirsteen Ross at Boom! Boom! Baby! who is making me a fabulous corset, when I get round to sending the mock-up back to her. Pictures copyright by Terence Mendoza and Retro Photostudio.